The scope of this guideline includes harms caused by the main forms of abuse and neglect. These are physical abuse, emotional/psychological abuse, sexual abuse, financial abuse/exploitation and neglect. This guideline also includes education and policy/organization/system recommendations that address resident-to-resident aggressive behaviour. Harms inflicted by one resident (often an older adult with cognitive impairment who is living in a long-term care facility) upon another resident, are distinctly different from the other forms of harm covered in this document. This content is included because institutions have the responsibility to provide safe, quality care for all residents. Furthermore, older adults living in institutions are in a relationship of trust with the organization, and a trusting relationship is a key element in most definitions of abuse and neglect. Beyond the scope of this guideline is a comprehensive review of systemic issues that may increase vulnerabilities to abuse or neglect such as the structure of the health-care system, care delivery models, funding structures and public policies. 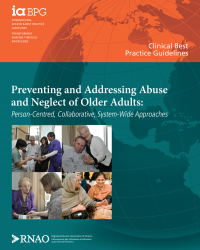 Other forms of harm that are important to acknowledge, but are also beyond the scope of this guideline, include self-neglect and aggression from an older adult resident towards an institutional employee. 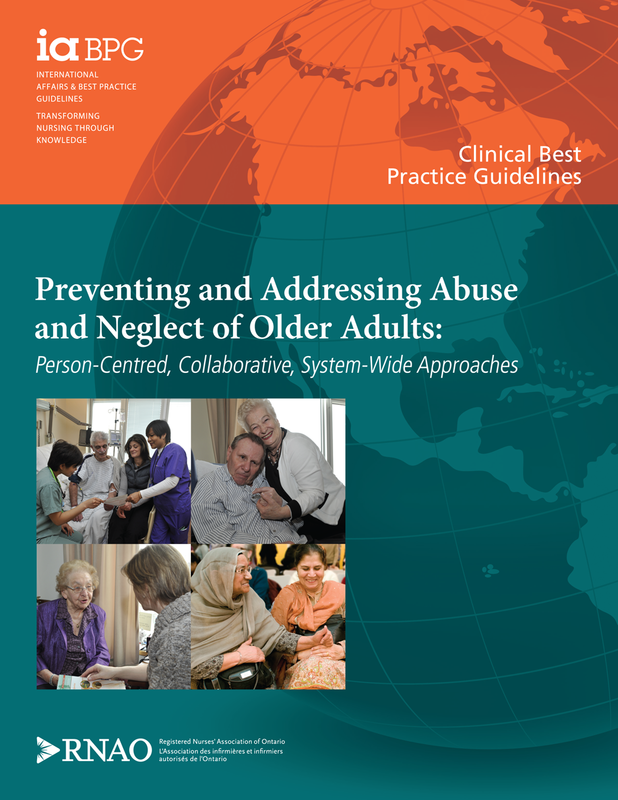 This guideline is part of an initiative funded by the Government of Canada’s New Horizons for Seniors Program and builds on a collaborative project between the Canadian Nurses Association (CNA) and RNAO, titled Promoting the Awareness of Elder Abuse in Long-Term Care. Get the Best Practice Success Kit specific to this intiative now.